At a time when the Scottish football hierarchy is discussing the future of the game and, if teams in Division 1 should be part of a restructured 2-tier SPL, it seemed a logical choice to take in a First Division tie. Some may be surprised that I didn’t chose to attend high-flying Dunfermline against Dundee or geographically close-by Partick Thistle v Stirling Albion. But there was something in my gut, an indescribable feeling that Morton v Cowdenbeath would be a cracker. So I set off, into what was pretty much horizontal sleet, for my train to Greenock full of the same sort of excitement I get when I see that the doughnuts in Tesco Metro have the little yellow “bar-code cancelled” sticker on them. 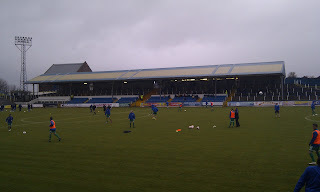 Forty minutes later I was at Cappielow Park, the home of Morton since the early part of the 20th century – which is how long I think the old man at the turnstyles had been sitting there selling tickets. Nonetheless, I paid my reasonable £15 and after a stop off for a pie and a cup of tea (<£2 all in) I took my seat in the Main Stand, soaking up surroundings. As the fans piled into Cappielow, everyone seemed to be hugely impressed by the stadium announcer’s choice of music. I can safely say that I’ve never yet be in a football ground where Grandmaster Flash and the Furious Five’s “The Message” was played. 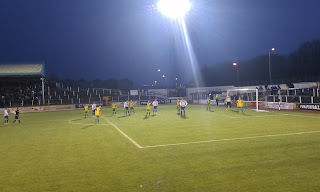 A stylish tune, matched by the impressive 1-touch warm up from Cowdenbeath. Technically, a clearly gifted set of boys – I thought the home team were in trouble and was especially worried for the centre half pairing up against ‘Beath No.9, Louis Coult who was earmarked early doors as “quality”. But boy, was I wrong. From the off Morton were the better side. Within a minute Derek Lyle should've put the home side ahead with a header from 8 yards out. This was the first of many chances that came via great wing play from Alan Jenkins who, alongside David O'Brian simply tormented Cowdenbeath's full backs all day. 'Beath's right-back, Mark Baxter was having a particular hard time against O'Brian and it got worse for him when a quick counter attack from Morton saw some good wide play from Lyle whose overhit cross somehow found O'Brian's outstretched leg and from 8 yards and a tight angle, he lofted the ball over David Hay and into the net. As suspected in the warm up, The Blue Brazil were technically very good, but it was obvious they'd lost their last 4 games as belief was evidently low. As for Lewis Coults, he was completely anonymous – what's that expression about judging books by their cover? Half time came & the 80s medley started, including - "Broken Land" by the Adventures - and with it the traditional Scottish football announcement of the winner 50/50 draw. A nice touch & £282 for Michael Walker from Greenock. The second half saw the game end as a contest when after 53 mins Jenkins, superb all day, jinked inside two men before having his deflected shot loop over the helpless 'Beath keeper. Two minutes later it was 3-0 as the impressive Brian Graham sprung the offside trap and finished with aplomb, rounding the keeper and running it right up to the line before tapping it in. Had it not been for defenders tracking back, I'm pretty sure he'd have done the schoolboy "lie flat and head it in" piss-take finish. From there the game petered out with 'Beath continuing to knock it around nicely without a threat & Morton using the front four to good effect on the counter. Overall, an impressive show from The Ton from back to front. Central midfielders Michael Tidser and Graeme Holmes were superb, dictating the pace of the game all day while always keeping the ball on the deck. My impressions of Cowdenbeath were simple - a side that on their day can clearly play, but on this day were sorely lacking belief. Granted this was only my first game, but on this evidence Scottish football is in quite good nick. At no stage did either side resort to knocking it long. Fans turned out in huge numbers for a relegation-battle of a tie and in awful conditions. And to a man, players looked technically efficient and physically in good shape. 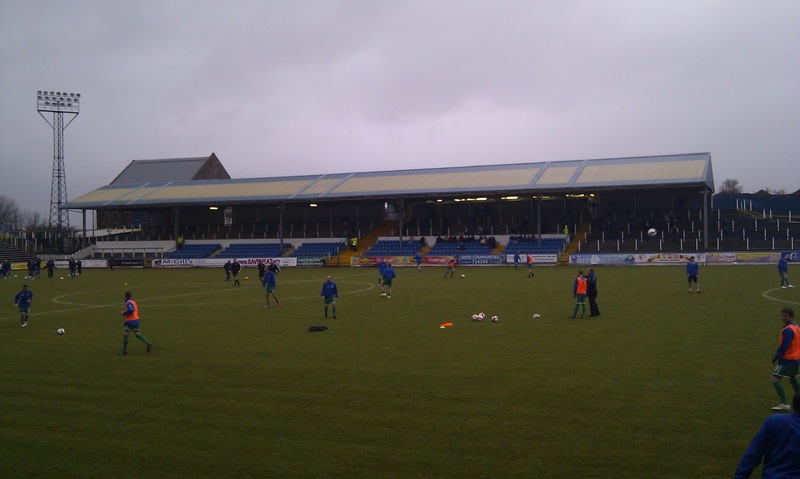 Recommendation: Pay Cappielow a visit if you get a chance.